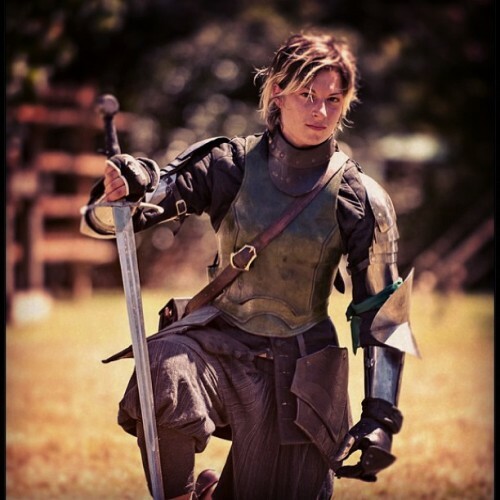 As worn, indeed, when she became the Champion of European Long-sword at Harcourt Park International Jousting Tournament, 2013. Not woman’s champion I may add, she beat men and women to win the title. Swinging that big heavy long-sword, which though blunted for obvious reasons still weigh in at 2.5lds and swung in anger can break bones and cause no end of damage to the unprotected. It’s a fairly safe bet therefore that when swing big heavy European longswords about, and importantly having them swung at her, a woman chose’s armour that actually protects those vital organs, bones and skin. The sad part is not that the fantasy armour is decorative rather than protective. I am not greatly concerned by this in comic books, games and movies. If that is the male equivalent in those same comic books, games and movies followed the same rules. However in general male fantasy armour is heavy, bulky, and indeed practical if overly ornate. From this one can assume the male characters have actually got vital organs to protect. Or perhaps one organ closely linked to the male ego to protect. This is I am sure far from news to anyone. it has all been said before and better by others. Indeed I recommend +http://repair-her-armor.tumblr.com/ as an entertaining viewpoint of the issue. This entry was posted in opinion, rights, rites. Bookmark the permalink.